Park Shin Hye and Jung Yonghwa play a lovely campus couple. On 25th May, the duo attended a photoshoot filming for MBC upcoming drama 'Heartstrings' at the Soeul Institute of Arts campus located in Ansan, Gyeonggi-do. 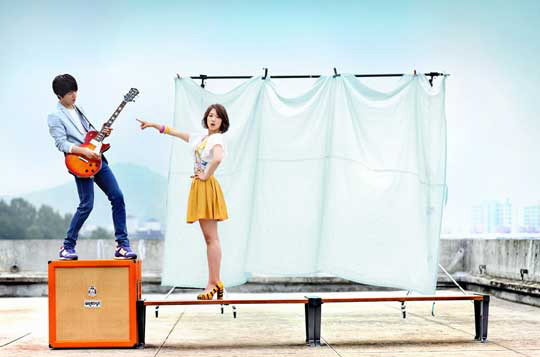 In the two photos released by JS Pictures, Jung Yonghwa is spotted playing the guitar with a passionate pose. Park Shin Hye is captured dancing like a butterfly with a variety of actions which are good representations of the nature of her character - a bright and bubbly girl. The two friends went up onto a high location to film the photoshoot. Despite the uncomfortable poses and location, the duo show their delightful faces throughout the shoot and drew applause from the staff. In the drama, Jung Yonghwa plays Lee Shin, a guitar genius; while Park Shin Hye takes the role of cheerful gayageum prodify Lee Kyu Won.They previously worked together in SBS drama 'You're Beautiful' in 2009 and have brought their friendship to their current drama project. on set, Shin Hye and Yonghwa are always seen playing tricks on each other, creating a friendly atmosphere. Heartstrings is set to broadcast on June 29, a melodrama telling the story of young people chasing their dreams at an arts university. 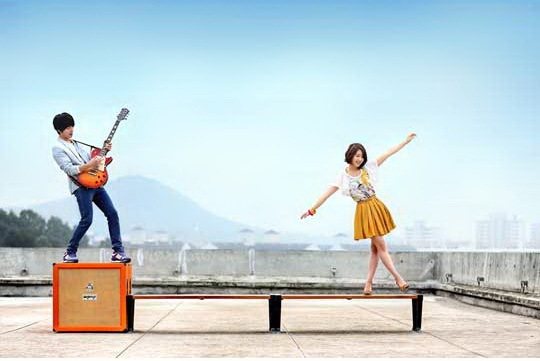 We'll be visiting the Heartstrings set in July 2011! Support the drama by joining our fan projects! They are so cute! Two more weeks! Can't wait!! !